Born in Kuwait and living in Dubai, Jitin runs his own merchandise business. Sonal was born in Jaipur but brought up in Toronto, Canada and is a successful entrepreneur in the healthcare industry in Dubai. Sonal had just moved to Dubai from Toronto when she was invited to the opening of a club in Dubai. A mutual friend introduced her to Jitin and they got along instantly. 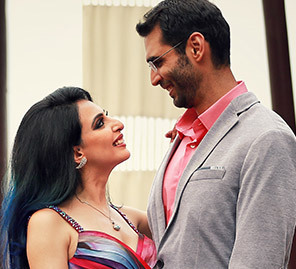 They’d been dating for two years, Sonal remembers and it had been a wonderful period of getting to know each other over long drives, exploring new countries, when on the 17th of November, this year, Jitin took her out to dinner at Dining By Design at Anantara, the Palm, Dubai. He’d booked a private beach strewn with the petals of 200 roses. 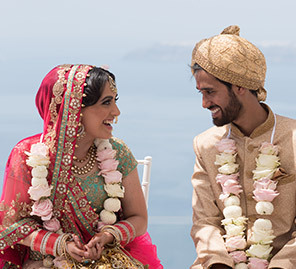 It was the perfect setting and when he proposed Sonal laughs, she had to say, "About time!" "I have always had three desires to fulfill while planning," the bride smiles, "A beach wedding, a daytime ceremony, and celebrations that lasted for three days with close friends and family." With that list in mind, Sonal, Jitin and Sonal’s mom Sunita traveled across Thailand looking at Phuket, Krabi, Bangkok, Rayong, and many more potential venues. "When we finally came to Sheraton Hua Hin Resort & Spa, we were amazed to be welcomed into our dream venue," Sonal says. "It was equipped enough to perfectly host each and every function and it was the only property which also had a club “@Black” on site, so it was a great fit for the afterparty." 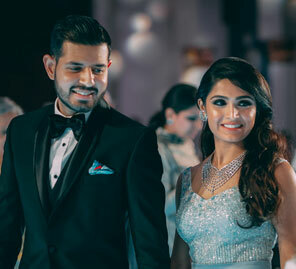 The couple's welcome dinner and engagement was themed ‘A Night With The Stars’. The décor was inspired by vintage cinema – black and white film photos of the couple, a movie-ticket-stub photo backdrop and a customized DJ booth with "Now Playing" signs. There were also performances by Flapper dancers. Sonal looked gorgeous in a beautiful gown by Manish Malhotra while Jitin looked dapper in a black tuxedo. The Pool Party had an Enchanted Garden theme brought to life with customized floral swings for the guests. The bar had the couples’ initials "J&S" inscribed on it. Russian dancers performed at this function. The wedding ceremony itself was held al fresco, surrounded by florals. Sonal arrived in a traditional Thai boat, festooned with flowers with a regal pink and gold exterior, piloted by a boatman in ethnic Thai livery. She looked stunning in a baby pink lehenga by Sabyasachi. Jitin was elegant and composed in a sherwani by Sarab Khanijou. The wedding dinner theme dictated an all-white décor. Awe and wonder were provided courtesy the acrobats who poured champagne from the ceiling while a stunning pearl white, a five-tiered cake was a glorious centerpiece. Sonal wore a beautiful white lehenga by Falguni and Shane Peacock. On one hand, you can’t do everything yourself, so ask for help. On the other, not everything will go as you planned so don’t be a complete control freak! Learn to compromise and it will be worth it. You’re not going to get to spend as much time as you want with friends and family so really cherish the moments and make sure you’re well rested before the events. Complete your pre-wedding shoot before all the guests arrive so you have plenty of time to spend with them. The same goes for your mehndi. I jumped into the pool during the pool party and my mehndi survived my wedding! Allocate one family member to be responsible for making sure you have photographs with your entire family at every event otherwise, later you will realize you never took any photos. Smile! Smile! Smile! Wedding Planner: I Do Etc.